Coming back to love or arranged marriage topic. I do not know which side to choose or should I ask if these two are really different from one another? For example, have a look at this. Since the time I have grown up, I always wanted to have a love marriage even at a time when I did not even understand the ‘true’ meaning of marriage. Why? Because I was a rebel and because in those days love marriage was more of a trend. And also because I dreamed of my life as a Bollywood fairy tale where I go on a trip and find a ‘Raj’ or a life where someone as funny-handsome-rich-desirable-honest-etc-etc as the ‘Rahul’ of Indian romantic movies would walk upto me with a marriage proposal. Ironically, I met many of them. In the autos, flights, trains, office mess, friends’ home, Orkut and even on a wrong phone call. While they all started out just as the Rs of the movies, much sooner than my expectations, they all showed their true colors – typical men. Men who woo you, who make attempts to make you laugh, who pretend they are jack of all trades, who sometimes show you attitude before you show it to them and who, at the end of the day, come down to just that one thing. Interestingly, all of them made me lose my interest in them much before that. But my faith in love remained. I kept telling myself that probably that is why love is so difficult, people say. I crossed 27 without any sign of the love I wanted and needed. I did fall in love more times than one can imagine – with a vegetable vendor once, with an unknown firangi stranger who helped me save my life at 12 in the night, with the sweet boy who walked upto me to tell me that I was the best orator he had ever met (and I gave him frowns or rather a bad attitude then) or the one who admitted he was an IIM graduate! Sadly, these bouts of love hardly survived beyond a few hours. Flashback to Meerut, my home town and my home. The day I joined Infosys as a SE, my dad had started looking for matches for me. Several proposals came my way – from microsoft to Xansa to a US firm to PhD in Switzerland to Defense to IFS to Infosys to Oracle to what not! And my typical answers to all of them were – not my type, spark nahi hai, aise stranger se shaadi kaise karoon etc etc. Four years passed. One day I asked myself ‘who is my ideal partner?’. And the reply was totally evasive. I did not know. That was the day, sometime in Feb 2009, when I discovered my true Self – I did not know what I wanted! And I handed over my life to my dad who knew what was better for me than me, myself. A proposal came that my dad described as ‘I just couldnt say no to’ and my dad got our numbers exchanged. We talked and I simply saluted my dad for being so right. I just couldnt say no. We were different yet complimentary to each other. His govt, transferable job meant an end to my corporate career but I did not care. I was sure I had found the biggest treasure of my life – an honest, simple, understanding partner who has strong moral values and superbly high thinking. We married three months later and now I am a happily married woman with a 2 yr old daughter. I and many of my friends can not believe that I am the same girl who could go on non-stop about spark, chemistry and the love bell and now I am settled in an arranged marriage as a loving, lovely house wife. The chatterbox in me is well complimented by his tight lipped self; my fascination to small, little things in life gets a direction with his long term vision and yet we are similar in many ways. What would you call this? Arranged marriage? Then what about the fact that I said YES to him without even seeing any picture of his? He was not on FB or orkut those days and nor he had any digital pic of his on his computer and yeah he had a very plain, basic mobile phone. But more important than that, I did not even feel the need to see his face. I saw his heart and that was enough for me. I was in love with him. Below is a picture from our initial courtship days. So, like the title of this post says, go for a happy marriage. Choose a partner who can keep you happy because of all things, happiness matters the most. It does not matter how you met. It does not make a deal at all if you dragged him into your life or he sailed or your parents scheduled the meet. What makes the difference is – are you both happy with each other? If yes, then three cheers to marriage! If you enjoyed reading this post, please share it using the buttons on the side. Sharing is good! statement,its like learning something positive and getting inspired. I really like your personality simple living high thinking. u both make great jodi no 1, mr thinker and mrs thinker. Hey.. thank you soooooo much..!!! this is indeed one of the sweetest comments on my blog. Thanks a lot again.. I so wish I knew your name 🙂 Knowing each other's names connects well.. isnt it? Raji.. I also wish all the luck to you! 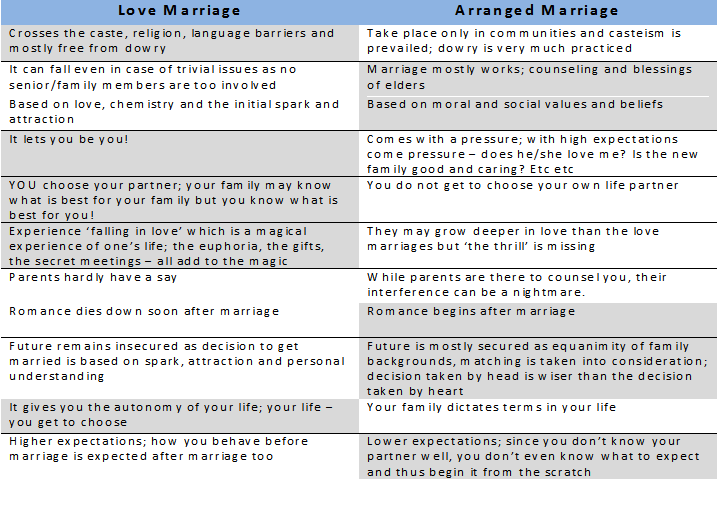 And yeah.. the best is to arrange the love marriage. 🙂 and thank you soooo much! Lovely and the best I liked is the caption… marriage is not about being love or arranged… its about Happy Marriage definitely. Thanks so much lady! Thanks a lot for writing in. I really love this article. It is true no matter where you are in the world, like Australia where I am from. So many people get caught up in the desire to fall 'in love' but I don't think people really know what 'love' is and I also think people stay in bad, unhappy relationships because they think they are 'in love'. There is no truer wisdom than to simply seek a 'happy' relationship and marriage. Thanks for writing in. 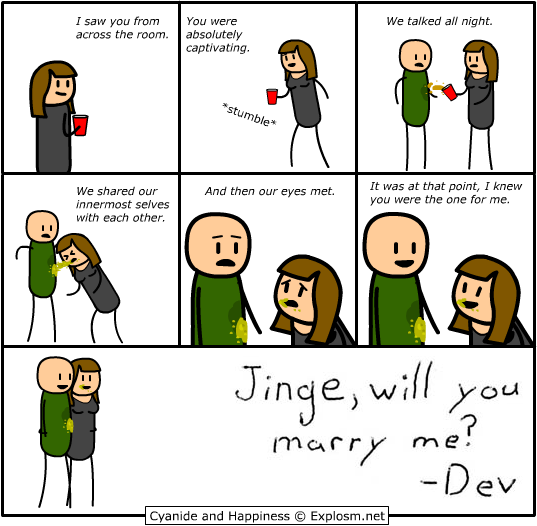 This may have also given you a clue about arranged marrriages. And you are so right. Some people are just hooked on to this idea of 'being in love' whether they are actually in love or not. seriously i am reading ur blog first time but its too meaningful and now just clicking on ur each and every post…. u r a gr8 communicator must say. So glad you took out time to comment here. Thank you so much! 🙂 Hope you stay around. Also happy that you find it useful. 🙂 Thanks again. So friend of mine, a girl, with whome i disscussed about my confusion last night, sends me this blog. I have been in love a few times but nothing ended up in marriage cause i was not settled and have always been scared of getting into any commitment when i do know about where i am gonna end up in my career.but now i am a well settled professional but with no on going affair. Recently my mom has been sharing some photos of girls, who she likes and wants me to think about. When it comes to this, i feel like how can i just marry a girl based on a photo and a little contact afterwards, and i remain confused. I dont knw whether, it is my fear of arrange marriage or marriage itself but it isn't helping. However, after reading this blog i just get some idea that rebillious minds could also work out with arrange marriage. Thanks. Sorry for the late reply. I really dont find much of a difference between an arranged and love marriage except that in former, meeting is organized by parents. If you remove that part, yes, the relationship and the journey is pretty much the same. I think when you look at the photo, if you like any of them, you should go ahead and meet the girl. Just now saw your blog!! and guess what this is the fifth blog of u m reading continiously!!! and m serchng for more 😀 I am amazed, i skipped a bit and fell in love with ur blogs <3 <3 Keep blogging!! Superb thinking & write about marriage is so impressive…..
Definitely, happiness should be the biggest and the most important factor while deciding about your biggest commitment of life. One should never compromise on this, else the life of two people (can be more in matter of offspring) is going to be totally devastated. Totally agreed. I sincerely believe if happiness becomes the ultimate goal, a lot of chaos will vanish from the world.